Preheat grill. Melt the butter in a bowl in the microwave. Cut the Brie au Bleu ILE DE FRANCE® into very thin slices, cut the ham into pieces that are the same size as the slices of bread. 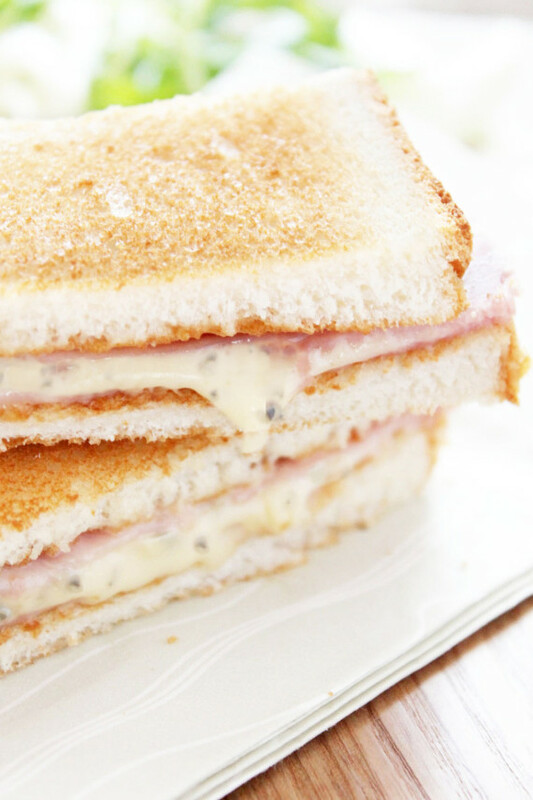 Place half the ham on 4 slices of bread then arrange the slices of Brie au Bleu ILE DE FRANCE® and the rest of the ham on top. Place the 4 remaining slices of bread on top and press down gently. Using a brush, coat both sides of each croque with melted butter. Just before serving, toast the croques for 3 mins on both sides under the grill. Take the croques out, cut them into 3 and serve straight away. Serve with small slices of tomato and rocket leaves in vinaigrette.